The road to volleyball success was not always smooth sailing for Anna Gragg. During her time at Big Sky High School in Montana, Gragg was consistently on basketball and track teams that would go far into state tournaments, but not in volleyball. Gragg recalled playing volleyball in high school. She never won more than 10 volleyball games in a season. Instead of letting those unenviable circumstances affect her, Gragg took the higher road and used that opportunity to foster a desire to encourage her teammates. “It taught me how teams can get along when we win, but it taught me how to bring people together in times of adversity,” Gragg said about her time in high school. Liberty University is a far cry from the days at Big Sky High in more ways than one. 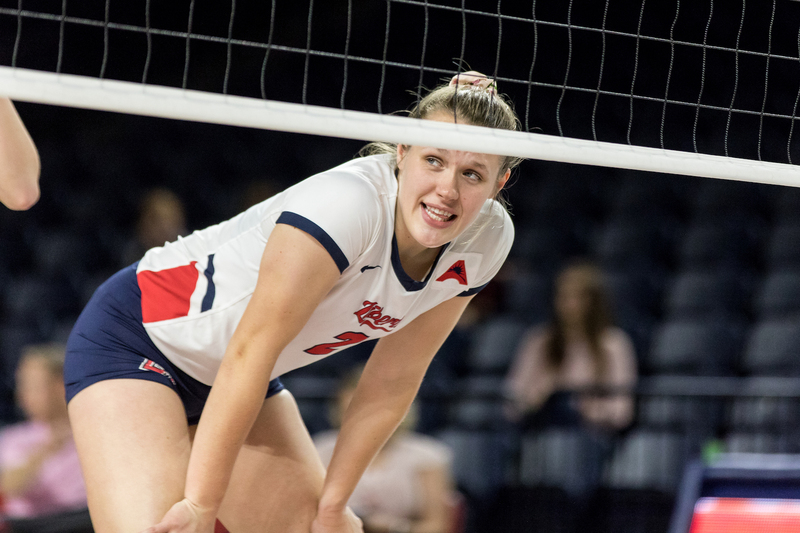 Gragg is a 6’3” middle blocker captain who has posted impressive numbers for the Lady Flames, playing in 91 of the 96 sets this season, maintaining an .886 serving percentage, 198 kills and 89 blocks on the year. 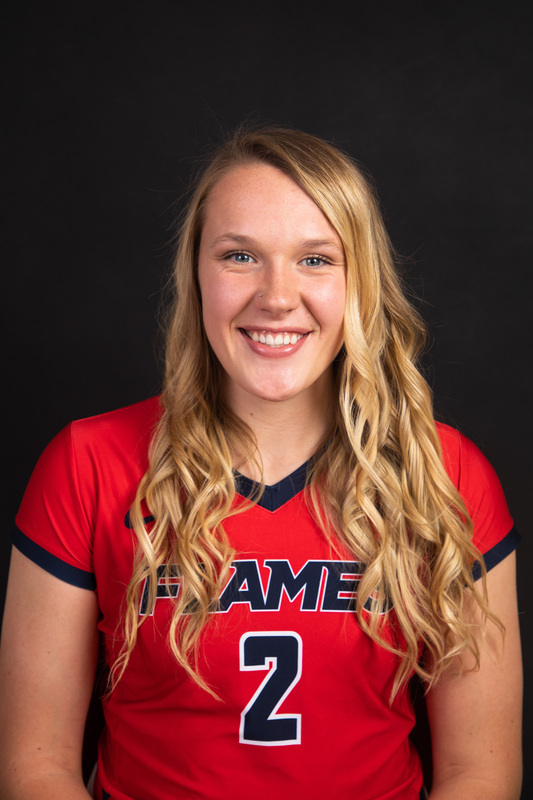 Her play is a large reason the Lady Flames are fourth in the Atlantic Sun Conference standings and have already locked up a spot in the conference tournament. But amidst the success on the court, Gragg continues to possess a humble attitude about her accomplishments. She continues to carry the mindset of encouraging her teammates through thick and thin that she developed in high school. “If I can give 100 percent of being encouraging to my teammates, I can distract myself and everything else flows in terms of how I play,” Gragg said. The encouragement Gragg gives to her teammates has helped build great team chemistry, particularly with setter Hannah Morris, also a junior. Both Gragg and Hannah came to Liberty at the same time, and Morris attributes this commonality and Gragg’s personality to the bond they have with each other. When they are on the court at the same time, this chemistry as a setter and middle blocker translates even further. Morris said she trusts Gragg to get the kill whenever the opportunity arises. “As a setter, you want to give the ball to the one you trust the most, and Anna is definitely that for me,” Morris said. Gragg’s play and character on the court are things that continues to impress head coach Trevor Johnson, who is in his 10th month at Liberty. Johnson inherited Gragg when he took over the program. Gragg possesses not only the talent he wants from his players, but the attributes he wants as well. Gragg, Morris and Johnson all believe that advancing far into the Atlantic Sun conference can be that “something special.” All three believe that the Lady Flames ability to compete with top teams like Lipscomb and Kennesaw State, combined with the low expectations of the team’s playoff chances from outsiders, creates a perfect storm of factors that could translate into great success come tournament time. “We are peaking at the right time,” Gragg said. The Lady Flames will need all of the contributions from Gragg and her teammates before they enter their toughest stretch of the year. Beginning Friday, Nov. 2, the Lady Flames have four consecutive road games, three of which are against the top three schools in the Atlantic Sun: Kennesaw State, Florida Gulf Coast and Lipscomb. The conference tournament will begin Thursday, Nov. 15 at Kennesaw State.